The New 'THUNDERCATS' Arrive! Warner Release the First Trailer of their Re-booted Animated Series! Warner Bros Animation have released a trailer for its new re-booted ThunderCats series. The new series will begin on the Cartoon Network later this month. 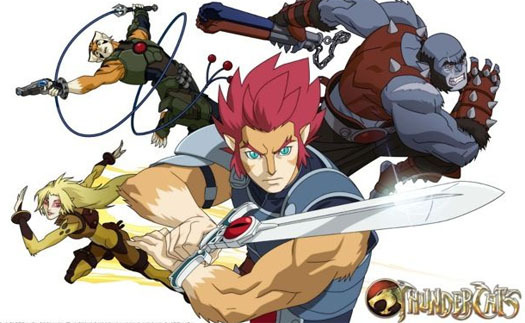 The original ThunderCats series ran between 1985 and 1990. Warner have given the new show a more anime-style art direction after collaborating with Japanese company Studio4°C. The series follows Lion-O as he leads the ThunderCats on a mission to fight off the evil Mumm-Ra and his followers. ThunderCats launches with an one-hour premiere this July 29th. Hit the jump to checkout the trailer. I'm reading: The New 'THUNDERCATS' Arrive! Warner Release the First Trailer of their Re-booted Animated Series!Tweet this!